Project recipients’ details Ms. Hari Maya Jimba is a single mother, who lives in Thapathali slum area since 15 years. She has four children. Her small home is made up of bamboo wrapped by old plastic and has poorly made tin roof. Her kitchen and bedroom is in same floor. Her kids use the same floor as a study room. Floor seems very wet, and lights are entering in the room from the whole of the tin roof. They don’t have electricity in their home. They are using kerosene as a source of light. Anyone can imagine how poorly this family is maintaining the livelihood in this slum area. Ms. Hari Maya herself is physically weak as she got problem in her leg. She cannot walk long distances. So, she cannot work as a labor outside. She has part time cooking job in school. Apart from this, she does not have any source of income. Sometimes, it is very hard to manage income for her kids for hand to mouth and for schooling. RECED has chosen her as one of the project recipient in Solar Mobile Charger, Income Generation Program. This program will help her to make extra money in her day to day life. And also, it will help to provide a service to charge the mobile of the slum area. Project recipients Name: Hari Maya Jimba Area: Thapathali Slum area. Proejct started date: Earning Table Chart: Time Frame	Number of mobile charged	Per mobile charge in rupees	Total in rupees	Total in Dolor First Week	Second week	Third Week	Fourth Week	Solar Mobile Charger an Income Generation program Pilot Project. 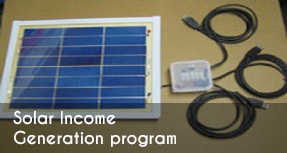 Introduction: The Solar Mobile Charging Tool Kits, An Income Generation program is one of the RECED pilot income generation programs. The program is designed and funded by an American Environmentalist Ms. Fran Crotty, who is a Co-founder of Solar Kits for Change, organization, USA. Jeff LaHay, who is the president of the Solar Kist for Change, and also professionally an electrician from USA design the solar mobile charger tool kits for this program. The goal of this project is to establish a business by combining solar power to charge a mobile in order to make money by a disable or low income people in the vulnerable community where people have no electricity access. Ms. Fran Cortty visited remote community of Nepal several times and made several solar system and bio gas donation. She is also a cofounder of RECED. She has very deep understanding of Nepali culture and social values. Ms. Fran has always supporting and helping mind in Nepal. Hence, she talked with her friend Mr. Jeff LaHay and both understand that the poverty caused in Nepal due to lack of employment opportunity. In this pilot project, solar mobile charging tool kits will be freely donated and trained to one the needy person of any deprived community. The project recipient will then act as a business owner with this solar mobile charging tool kits. So, the business owner will take at least Rs.5 to charge a mobile of the community people or neighbors. This will help to make money and it is estimated that at least Rs. 3000.00 will be generated each month through this business. Technical parts of Solar Mobile Charger tool Kits: The solar mobile charger tool kits contains following item: 2*8 watt solar panel, power control box, 7am/hr battery, AC adaptor, mobile voltage adapter and flash light. 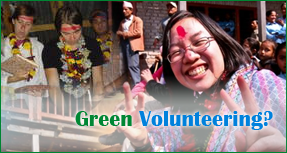 Project Implementation Date: December 2013 The project location: Different remote part of Nepal and slum area of city. For this pilot project different village of Bara district and slum area of Kathmandu has been chosen.